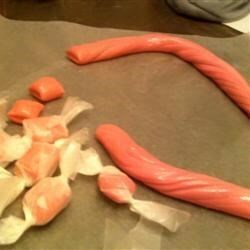 "A quick and easy recipe for any flavor of taffy you can think of!" In a large saucepan, stir together the sugar and cornstarch. Add the butter, salt, corn syrup and water; mix well. Bring to a boil over medium heat, stirring to mix in butter. Heat to 275 degrees F (134 degrees C), or until a small amount of syrup dropped from a spoon forms hard but pliable threads. Remove from heat, and stir in the vanilla, flavored extract and food coloring. Pour into a greased 8x8 inch baking dish. When cooled enough to handle, remove candy from the pan, and pull until it loses its shine and becomes stiff. Pull into ropes, and use scissors to cut into 1 inch pieces. Wrap each piece in waxed paper. Taffy is a soft ball candy and therefore the temperature should be 234F and not 275F! 275F is almost hard crack which is candy cane consistancy! VERY tasty! but it came out hard for me, perhaps I didn't have my thermometer set to the right depth. this did not work for me. It turned out to be a hard candy. I do not think I will try again. This is a cool, quick recipe that my kids love! this is not working! i have been boiling this for an hour now!!! it is not going above 200 degrees, not browning and not thickening. something is wrong.